"Ideal for high volume centralized use in departments and copier areas." The GBC 5220S Strip Cut Office Shredder - Shreds 17 - 19 sheets at a time including staples and paper clips. 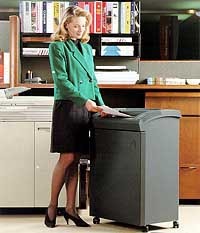 Extra large 4.92 cubic foot shred bin. Continuous duty rated motor. Auto on-off button. The shredder has an EZ-feed throat. Bag full shut off. The shredder has an auto on-off jam. SmartShred Controls-separate indicator lights for power on, bin full, overload and door ajar. In-cabinet bag storage compartment ensures bags are always at your fingertips. Shred Size (Inches) � 1/4"
Shipping Weight � 125 lbs.